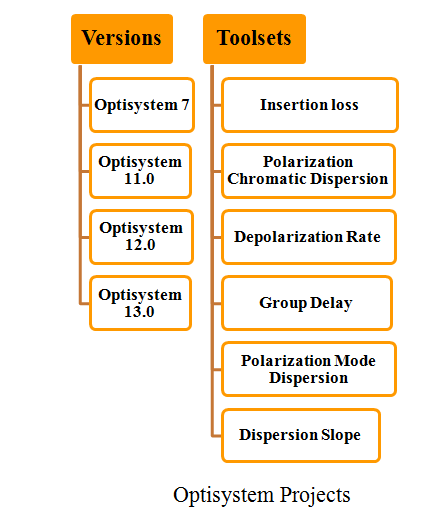 Optisystem projects is an innovative optical communication system simulation package to design, test and optimize virtually any type of optical link in physical layer of broad spectrum of optical networks. We ensure optisystem academic project an system level simulator based on realistic model of fiber optic communication system, we offer optical communication system projects involves optimize a large parameter as transmitter, optical fiber, receiver, amplifier, optical multiplexers, optical demultiplexers, optical cross connects, optical and drop multiplexers. We provide optisystem projects which is easily extended with addition of user components and seamlessly interfaced with wide range of tools. Radio over fiber an efficient technology that ensure effective convergence of optical and wireless access network system by this technology we modulate light by radio signal & transmit over optical fiber link to facilitate wireless access. We use single mode fiber optic (SMF) by different wavelength of laser light to increase demand for bandwidth. We provide this technology which a microwave signals are distributed by means of optical components & techniques. It includes central site and remote site connected to optical fiber link or network. Immunity to radio frequency interference. It use Viterbi algorithm to equalize input signal by dispersive channel. EDA tool offer integrated S-parameter support which reduce design cycle time. It is a simulation of complex inter satellite communication link. It empower unique bidirectional capability of optisystem, which facilitate AWG design based PONs. The toolsets are insertion loss (IL), polarization chromatic dispersion (PDC), polarization mode dispersion (PMD), dispersion slope, depolarization rate, group delay (GD) and dispersion. The components are DC blockers, power splitters, hybrid coupler and combined are solution of ROF simulation application. We use optisystem to estimate symbol error in user defined regions & targets. 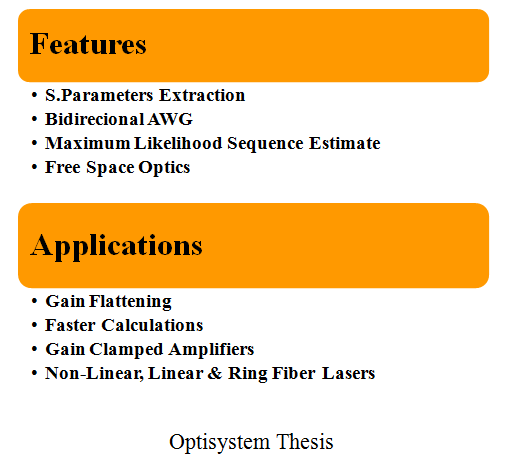 Optical fiber models include cross phase modulation, four waves mixing, stimulated Raman scattering and cross phase modulation of optisystem. Non linear, linear and ring fiber lasers. Gain flattening and faster calculations.